Hyundai is going to reveal the much awaited Santro on October 9th in India and launch is expected to take place by the end of the month. The upcoming hatchback will be offered in 7 colour options – Polar White, Sleek Silver, Stardust, Marina Blue, Fiery Red, Diana Green and Imperial Beige. 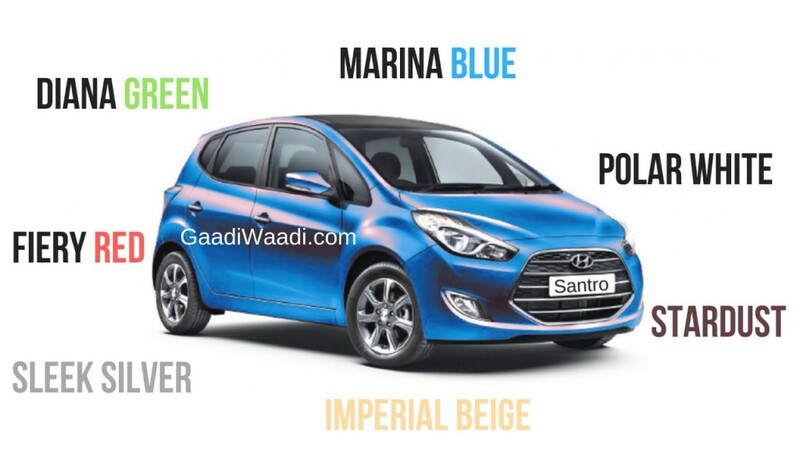 Most of these colours are already available in Grand i10 and other models from Hyundai. The Santro is based on the modified platform of previous generation i10’s HA platform and the tall boy design theme from its predecessor will be carried over. The front will get signature cascading grille of Hyundai along with swept-back headlamps and a new bumper. We can expect top end models to come with 14-inch diamond cut alloy wheels. The rear design also took some inspirations from Grand i10 and overall, the hatchback will appeal to both family and young buyers. The interior is expected to be finished in black and beige colour combination. The gear lever will be integrated into the dashboard like Grand i10 to liberate more space in the centre console. Hyundai will offer Santro in four variants – Era, Magna, Sportz and Asta. The top end model will come with features like 5-inch touchscreen infotainment system with Apple CarPlay and Android Auto, keyless entry, steering mounted controls, cooled glove box, rear AC vents, electronically controlled outside mirrors, reverse parking sensors and more. The upcoming Santro will come with safety features like dual airbags (single airbag on base variant), ABS and Electronic Brake-Force Distribution (EBD). The Santro will be powered by a 1.1 L four-cylinder petrol engine, producing 69 PS of power and 99 Nm of torque. This engine will be mated to 5 speed manual as standard. Hyundai’s new ‘Smart Auto’ gearbox will make its debut in Santro and it will be offered in next generation of Grand i10 and other models. We can expect efficiency to be par among with rivals and the automatic gearbox will be offered with top end variants only. The base variant is expected to be priced at Rs. 3.5 lakh and top end auto around Rs. 6 lakh (Ex-Showroom).